Waffle cradle heel cushion with lining. The lower extremities are very susceptible to the occurrence of pressure ulcers, with the heel being the second most common site on the entire body. The Foot WAFFLE® Custom surrounds the lower limb in air and is designed to float the heel while sustaining the integrity of the foot, ankle, calf and Achilles area. 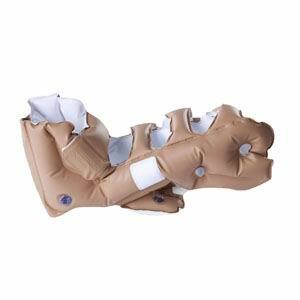 The air-filled straps and foot pad offer pressure ulcer prevention, treatment and patient comfort.